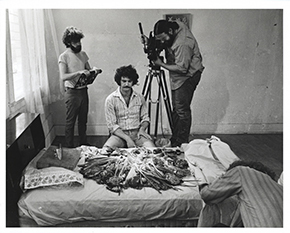 Pierre Bismuth, still from Where is Rocky II? Ruscha’s three films were all made near the start of his career. Recently unearthed and restored, The Books of Ed Ruscha (1968-9) features his childhood friend, musician and comedy writer Mason Williams, rough-handling these limited edition art objects. 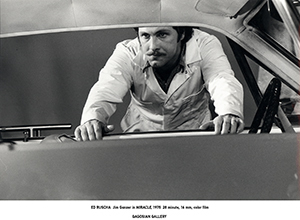 Ruscha’s second film, Premium (1971), is a self-parody of the artist as a young man, starring L.A. artist Larry Bell, in a filmic adaptation of his photobook Crackers. The last film, Miracle (1975), has artist Jim Ganzer playing an auto-mechanic who undergoes a metamorphosis while repairing the carburetor of a ’65 Ford Mustang. 9 PM Where is Rocky II? In 1976, American artist Ed Ruscha allegedly made a fake boulder out of resin and hid it among real ones somewhere in the Mojave Desert. Named Rocky II after the Sylvester Stallone film, the artwork is never spoken about publicly nor is it listed in any catalogue of Ruscha's work. In this noirish documentary, Pierre Bismuth (Academy Award–winning writer of ETERNAL SUNSHINE OF THE SPOTLESS MIND) hires an LA private detective to find the fake rock as mystery ensues. Photo credits: ©Pierre Bismuth. Courtesy of the artist, Jan Mot Gallery, and Mongrel Media. ©Ed Ruscha. Courtesy of the artist and Gagosian.